Shutterfly is a well-known online retailer for personalized photographs, gifts, and more. Based out of California, the personalized card company provides service for about 57% of the market, according to InfoTrends. With the majority of their business surrounding the holidays, January is the best time to reflect. Having 3 of our ST1046 models for just over a year, we’re proud to have had the privilege to serve one of their three U.S. facilities; in Minnesota. A Distribution Center Compactor from Sani-Tech was the clear choice for the company who goes through paper more than any ram-style compactor could handle. 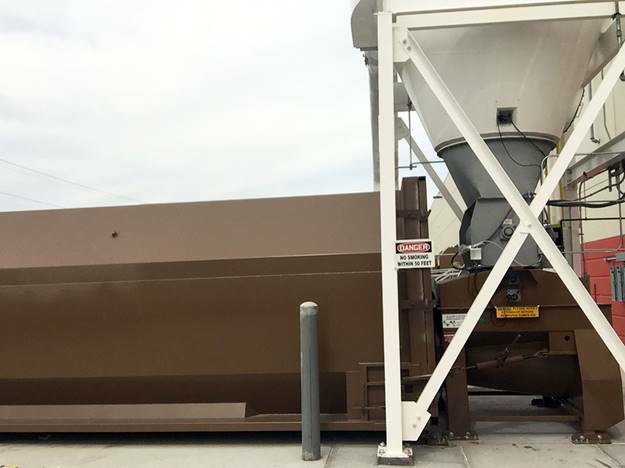 The design of our compactors allows for more refuse and takes less time to deal with because it’s a smooth-running operation. This install included a transition piece for the Auger Compactor to fit under an existing air system. Our dealer at American Services oversaw the project where our machines are running daily for the $60 million facility. “Auger compactors pre-crush and compact in one powerful motion. While processing material, the auger runs in a highly efficient continuously forward direction, crushing and reducing the size of virtually everything that is fed. This enables the auger compactor to process waste up to five times faster and a have a higher compaction rate of up to 2-3 times as much as any other type of waste compactor. DMH Companies & American Services Corp.